Human Rights Watch released the World Report 2019 this week, and in it the agency documents how the world is fighting back against tyranny. It may be tempting to believe that, with the rise of far right populism in the West as seen in our media, the world is quickly backsliding to less free, more violent and oppressive times. However, a new 674-page from Human Rights Watch says that, while certainly the rise in authoritarianism is alarming, the much larger trend is one of fighting back, from grassroots resistance to governments taking a stand. The report takes data on human rights laws, policy and major events from across the world and spans more than 100 countries. It is one of the most comprehensive documents of its kind. For this data to yield optimism is, therefore, a cause for hope. The report cites a number of instances of human rights abuses and the resulting protests. For example, Hungarian leader Viktor Orbán has become notorious for his administration’s growing attacks not just on immigration and asylum claims but for trying to abolish restrictions on working hours and attempting shut down the Central European University. People took to the streets to protest. Just as importantly, those protests were heard at the highest levels of government. European Union leaders started the process that could end in economic sanctions against Orbán’s government and others that are attacking human rights. This was achieved through a large consensus of more than two thirds of EU leaders—almost 70 percent—demonstrating that this is not a case of a powerful liberal lobby protecting human rights. It’s a growing core of leaders who believe that we can’t allow these freedoms to die. The Philippines continues to be an area of concern, where an ongoing drug war is leading to hundreds of fatalities and human rights abuses. The continued armed conflicts in Syria and and Yemen are also concerning. On each of these counts, however, people power has helped drive attention at the top levels of our governments. For example, frameworks are being put in place to help those facing famine in Yemen and try to manage the Syrian crisis, even in the face of anti-asylum hostility in Europe. By the same token, international governments have hit out at all attempts to demonize asylum-seekers, even when those calls have been made by once powerful allies. Perhaps most high profile of all has been Donald Trump’s outlandish attacks on people fleeing violence from Central America. There, too, people power rejected these lies and delivered a bruising defeat for the Republican Party in the midterm elections. The electorate sent an even starker message by raising up voices from across the LGBTQIA spectrum and from many different racial and ethnic backgrounds. The report notes that in many places in the world, authoritarian leaders have been deposed and attempts at power grabs have been prevented by the safeguards of democracy. For example, in Sri Lanka checks and balances—helped in no small part by public demonstration—prevented the current president from succeeding in what has been referred to as a “bloodless coup” wherein he attempted to move unilaterally to install former president Mahinda Rajapaksa into a position of power. Roth warns that while “victory isn’t assured”, the past five years demonstrate that there is ”a powerful human rights counterattack” that is actually gaining ground and success. The report does not shy away from highlighting areas in which autocrats continue to hold death grips on the societies beneath them. For example, Chinese authorities are taking more and more liberties from the Chinese people, stealing away rights to expression and a free press while expanding censorship. This has manifested most recently in Beijing’s crackdown on Twitter users. Authorities have chained people to chairs for eight hours and interrogated them over simply using the platform to express themselves. Even there, though, users have refused to take down their tweets, even in the face of threats of violence to them and their families. Significant challenges remain, that is clear, but this report is a timely reminder that, though prevailing chatter might tell us the world is broken beyond repair, the power and strength of people throughout the world is burning bright. Together, we are fighting back against tyranny—and we are winning. Photo credit: Samantha Sophia on Unsplash. Human rights violations are any action that violates the personal freedom and rights of a human being. Putting children in cages and drugging them so they'll be quiet and compliant is a violation of human rights. Forcing toddlers to "defend" themselves before a judge is a violation of human rights. 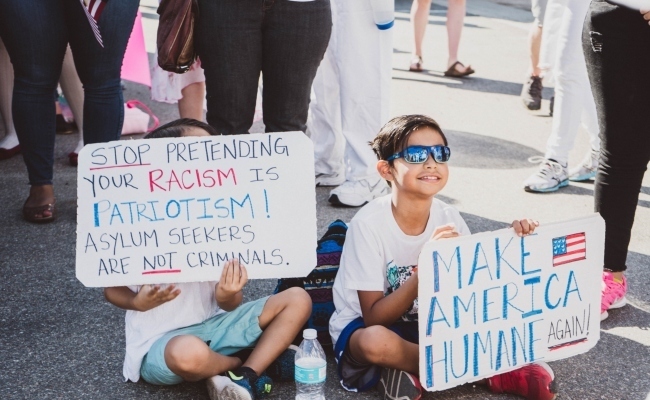 I like the signs the kids in the picture are holding. I think Human Rights is one of the most important challenges of this century, right behind Climate Change and bringing the democratic process to the world. Authoritarian regimes have never been good for anyone but those in power throughout history, they never will be. Leaders must be chosen by the people they lead - this is a huge challenge given the state of the world today, but this is a movement that will not be stopped as we move ever nearer to a truly civilized world.